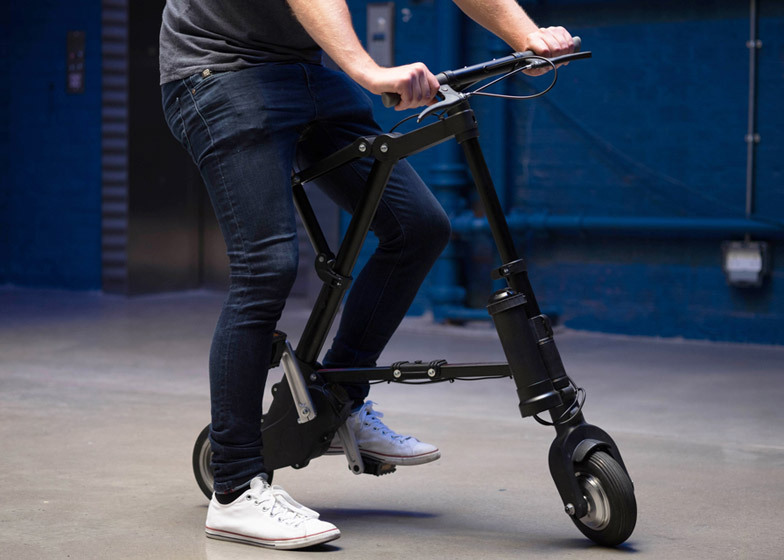 Clive Sinclair launches "world's lightest and most compact electric bike"
British inventor Clive Sinclair has launched a crowdfunding campaign to produce an electric version of his lightweight foldable A-Bike, with wheels that are just 13 centimetres in diameter (+ slideshow). 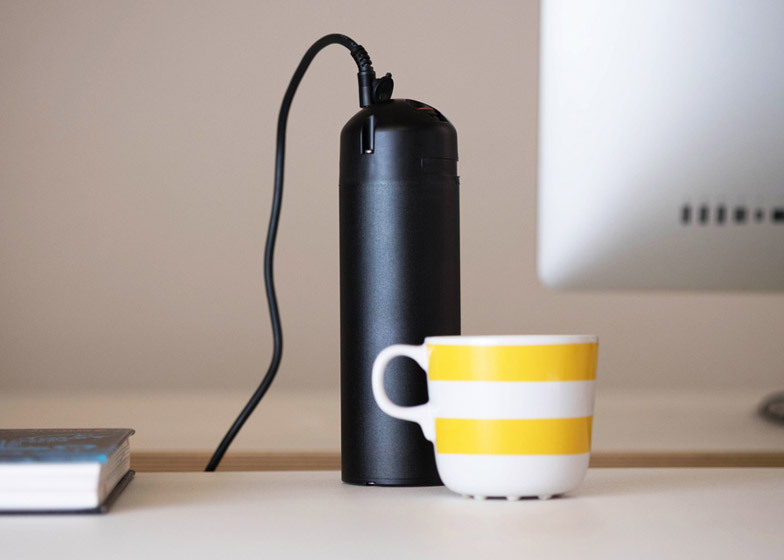 Update: the A-bike surpassed its crowdfunding target after just two days. 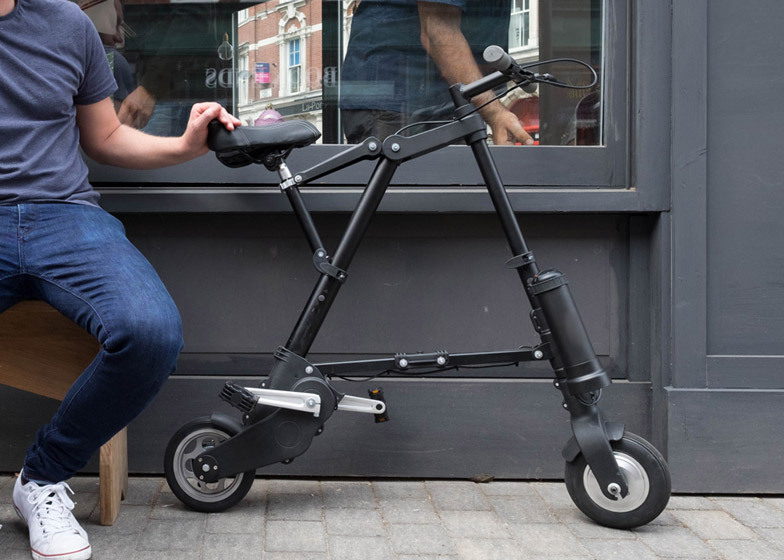 Developed by original A-Bike product designer Alex Kalogroulis, the updated version shares the distinctive A-shaped frame of the original, with its tiny wheels and fast-folding mechanism, but also includes a motor in the front wheel that starts up when the user begins pedalling. "A sensor detects the pedals are turning and gently starts the motor running," explained Kalogroulis. "If you slow down a bit and need more assistance, for example when you reach a hill, the motor automatically delivers more power to make pedalling feel effortless." "Once you stop pedalling, the sensor will switch off the motor," he continued. 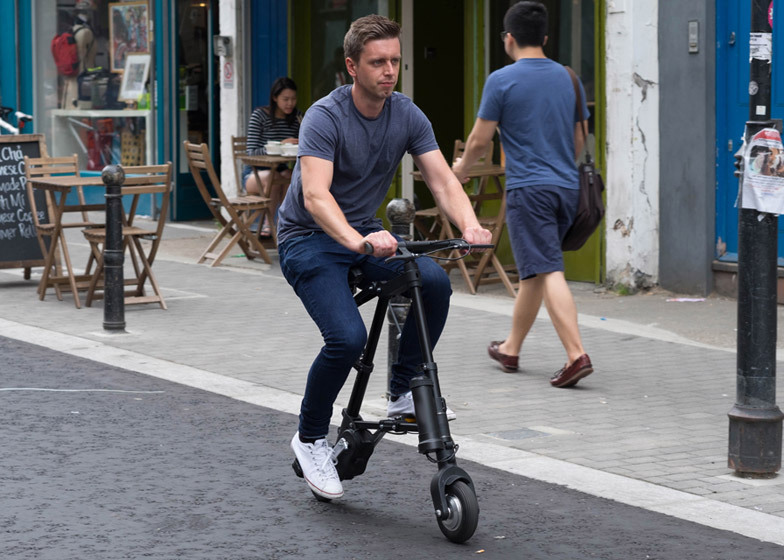 "This keeps the system legal in the UK and Europe and allows users to ride the A-Bike Electric without requiring a licence, tax or insurance." 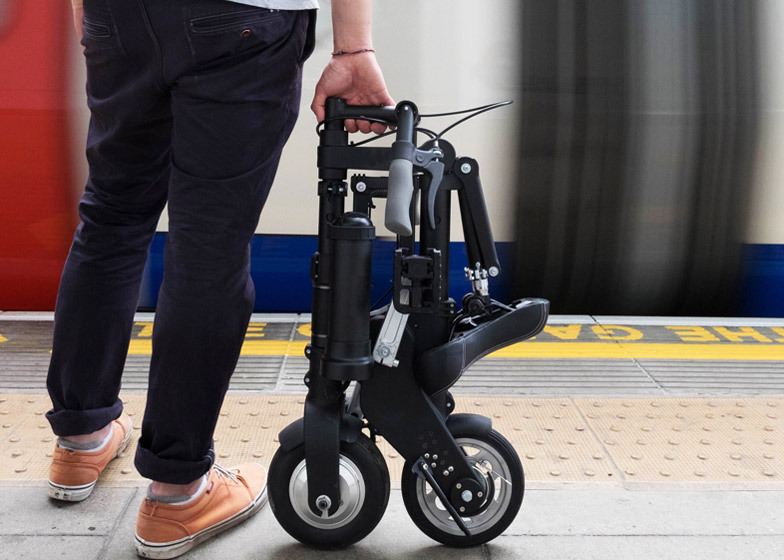 Black telescopic tubes made from aircraft-grade aluminium make up the frame of the A Bike Electric, and allow it to fold down in under 10 seconds. The lightweight materials mean that the entire bicycle weighs 12 kilograms. The designers describe it as the "world's lightest and most compact electric bike". Although the wheels have a diameter of only 13 centimetres, a dual-chain system allows for a normal pedalling action. "The dual chain drive has been put into A-Bike Electric to allow for having the lightweight compact wheels," said Kalogroulis. "They have been optimised so that the pedalling rate matches the rate that the wheels turn to make it feel like riding any other bike." Sinclair, a former electronics journalist, became one of the UK's best-known inventors in the 1970s and 80s, launching a string of home computing products including the ZX Spectrum games console and the UK's first home computer priced under £100. Earlier this year a computer based on Sinclair's original design for the ZX Spectrum, called the ZX Spectrum Vega, raised £150,000 in two days on crowdfunding website Indiegogo. After selling his electronics business to computer manufacturer Amstrad in 1986, Sinclair turned his attention to transport. His first attempt was the Sinclair C5 – a one-person battery-powered electric vehicle that attracted a flurry of media attention but failed to find a market. 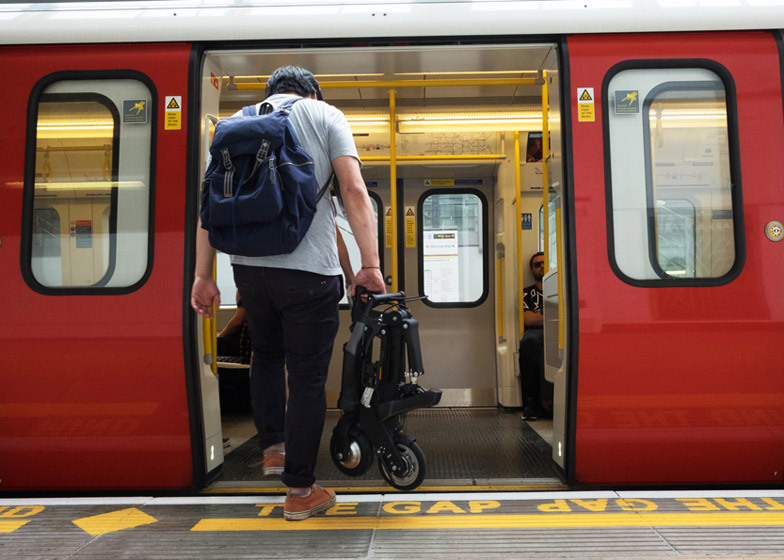 The A-Bike, launched in 2006, was the result of a five-year research and development programme that aimed to change the way bikes were viewed by city commuters with a compact and lightweight design that could fit into a rucksack. 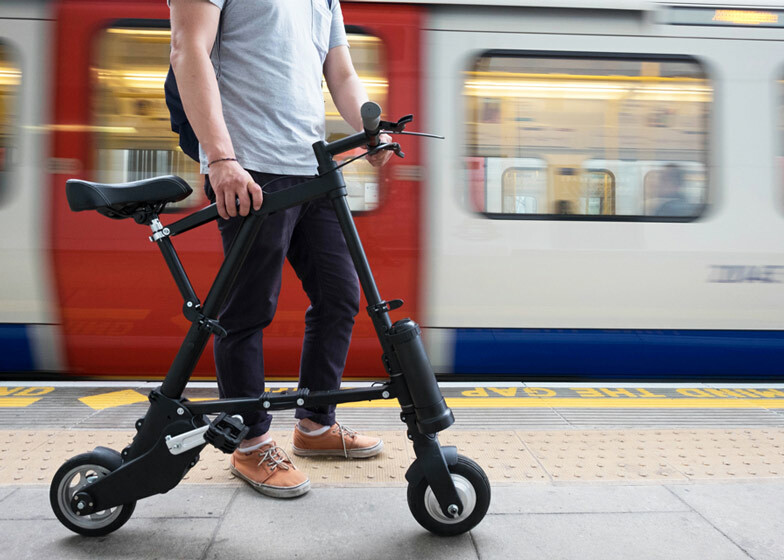 "The idea is that if you have a bicycle which is seriously lighter and more compact than anything existing at the moment, it will change the way in which people see bikes," said Sinclair. More recently, Beijing-based studio Impossible Technology designed a folding electric bike made up of circular components that folds into a backpack. Weighing just 5.7 kilograms, the original A Bike design was equivalent to the airline hand-luggage allowance at the time. The new version follows the same principals but is powered by a rechargeable lithium-ion battery, with enough charge to power the motor for up to 25 kilometres. The battery is placed on front of the frame under a "quick-release strap". "We decided to use lithium-ion batteries in place of lead acid as they are lighter in weight," Kalogroulis told Dezeen. "The quick-release strap means riders can detach the battery for convenient charging." A red button on the side of the battery allows the user to turn the motor on and off, while four LED lights indicate the amount of power left. 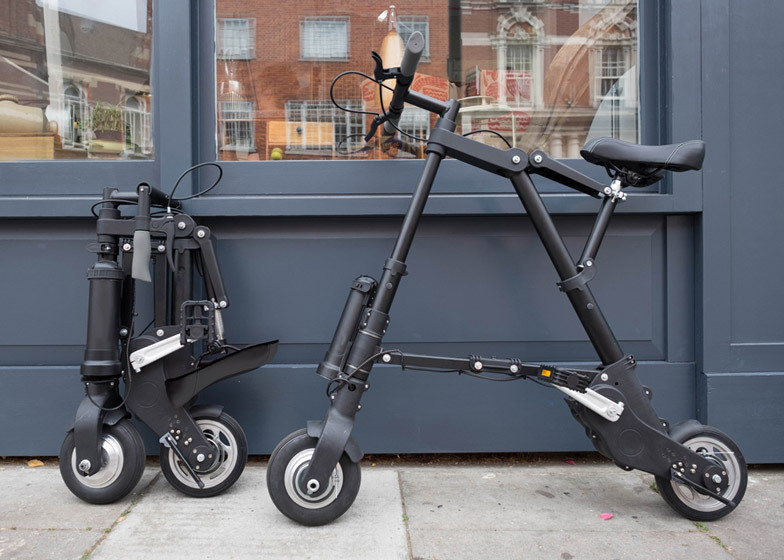 The A-Bike team hopes the Kickstarter campaign will raise £40,000, and a limited number of initial backers can purchase the bike for a discounted rate of £449. 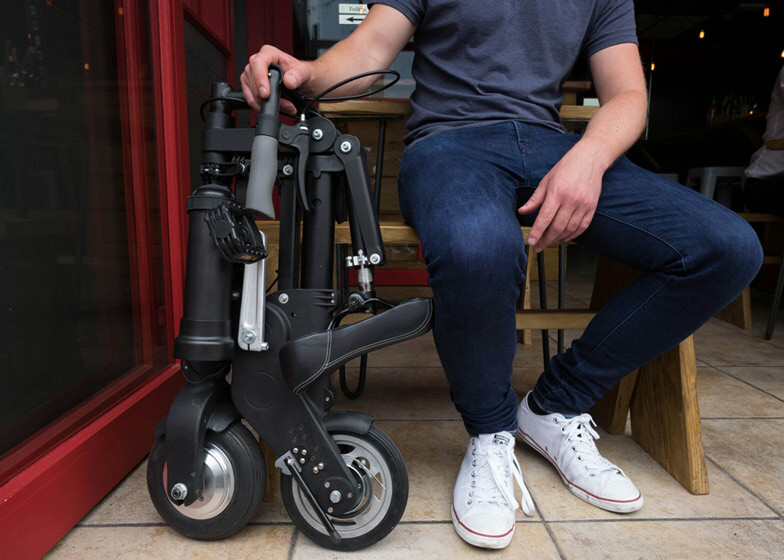 A three-wheeled bike similar to a pedal-powered Segway was also launched on Kickstarter campaign earlier this year, smashing its goal of £21,000 by raising over £86,000.